Monday morning is a time of new beginnings. For many of us it is the start to our work or school week. Even people that start work on a different day of the week, call whatever day that is “my Monday.” We tend to use the weekend to shop, so we have enough food in the house. We get a lot of the household tasks done over the weekend (laundry, cleaning, etc. ), so we can start fresh on Monday morning. I remember in my dieting days (I don’t diet any more, but that is a whole different story), Monday was always the start to a new diet. I don’t know about you, but I always got excited and I made sure to be totally prepared. I bought the right foods and mentally got enthusiastic about the changes to come (weight that I would lose) and how different I would feel at the end. I would have such high hopes to begin and to get going that first Monday morning. When making changes in how or why we eat, there can come some self-sabotage in the form of overeating. This is the point where you might get frustrated with yourself and say, ‘who cares, I am just going to eat what I want.” This is your rebellious side wanting to sabotage your progress. See every meal and every snack as a start over moment. The last meal or snack does not matter. Be confident and just do it. Be in the solution and that forward progression. Let go of the judgment (I can’t believe I ate that much, I’ll never stop overeating) and let in the positivity of a restart. Saying to yourself, “I can do this, I am restarting now.” Remember positivity propels you forward, negativity propels you backward. Emotional eating is tough to just stop instantly; it is not uncommon to have setbacks and frustration. Overeating can happen without your notice: you eat more than you want at a meal, you engage in grazing all day; you eat something because it is yummy. It can stop there. The problem is compounded when you emotionally beat yourself up with thought such as; “I cannot believe I did this, this was horrible, I will never be able to lose weight, I will never stop over eating.” Then you feel guilty, depressed, sad or upset and then you overeat AGAIN. There is a way out. 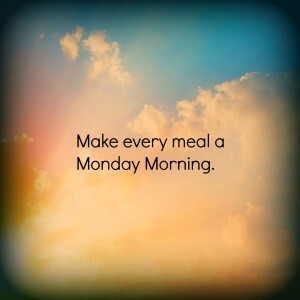 Try to consider each meal and each snack a Monday morning: a fresh start. You will have a greater chance at being successful in changing your eating patterns. How do you make a setback with food an opportunity to start over? Let us know in the comments section below. I would love to hear your suggestions.